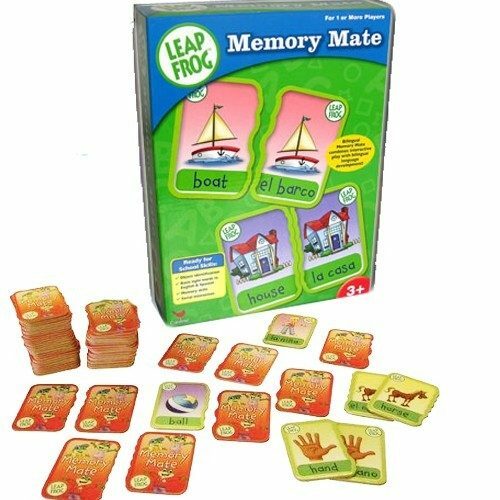 Leap Frog Bilingual Memory Mate Card Game Only $9.99 Down From $29.99! Ships FREE! You are here: Home / Great Deals / Leap Frog Bilingual Memory Mate Card Game Only $9.99 Down From $29.99! Ships FREE! GearXS has this Leap Frog Bilingual Memory Mate Card Game on sale for $9.99 (Reg. $29.99) + FREE shipping! This Memory Match system combines interactive play with “grow with me” interchangeable cards. Little ones can get school-ready by working on these skills: memory, Spanish language, and social interaction. Picture-to-picture matching and bilingual words provide a grow-with-me format. The unique locking system allows the child to match confidently!